I have been more and more impressed with the No7 Limited Edition Collections with each and every release. I thought it might have peaked with this year’s spring collection – with that amazing highlighter and the gorgeous bright lipsticks. But then I saw a twit pic from the wonderful Lisa Eldridge giving a sneak peak of the Summer collection…. Everything about this collection just oozes hot summer, I love how the bronzer looks like the wave marks on wet sand. This texture is also used for the pretty shadows, that on first glance look like simple neutrals with two brown/bronze shades – but the addition of a smokey silver and sandy yellow make it a bit more unusual. Another thing about the bronzer that strikes me is the fact that it is matte – not shimmery at all, very unusual to find. Ooh, and the golden run lip gloss has gold flakes – can it feel any more luxurious?! The gloss will also be available in a peach colour that looks very pretty. I love the bronze packaging – it has something a bit 1970’s about it in my opinion. Yet, very sleek and stylish – I certainly wouldn’t be ashamed to pull these out and touch up on the tube. 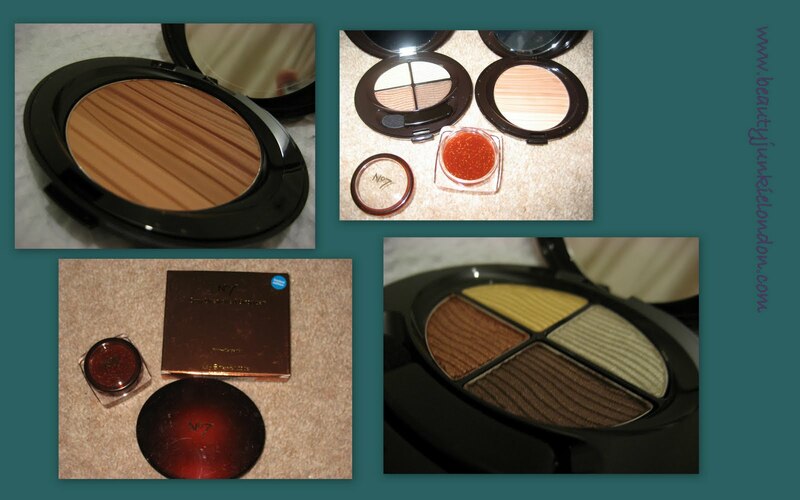 Both the eyeshadow and bronzer also have decent sizer mirrors – a definite plus. This is just a quick post to give you a peak of what is coming soon – when I have had chance to give them a proper test I will report back on what they are like in action. These were sent free of charge. All opinions are my own. I’ll definitely be looking out for the bronzer. I’ve been looking for a nice matte bronzer for a while. I have Benefit Hoola but it’s a bit grubby looking on my pale skin. That bronzer looks great, can’t wait for this stuff to hit the shops! Umm, the packaging for those e/s quads reminds me of the Spanish brand Astor.